Hibiscus tea is delicious, available everywhere and comes with tons of health benefits, including weight loss. The herbal tea, made from the parts of the hibiscus plant, has a cranberry-like flavor and has been widely consumed for centuries. Consuming it will aid your weight loss goals directly and indirectly. First of all, it tastes amazing and you can drink it hot or cold. The great part of drinking it is that Hibiscus tea has no calories. You can easily replace drinking sugary drinks like sodas or fruit juices that have tons of calories. One small can of cola has 150 calories. Some people religiously drink at least one can a day. Only by drinking cold or hot hibiscus tea instead of that one can will help you lose more than 15 pounds a year! Remember this next time you try to grab a coke from your fridge. Now, you might be thinking – ‘what if I drink diet coke instead?’ Sure, but what do you think is healthier, an artificial sweetener that eventually slows down your metabolism or natural hibiscus tea that is great for your overall health? Numerous studies link high-stress levels to obesity and stressed individuals tend to have higher BMI (body mass index). 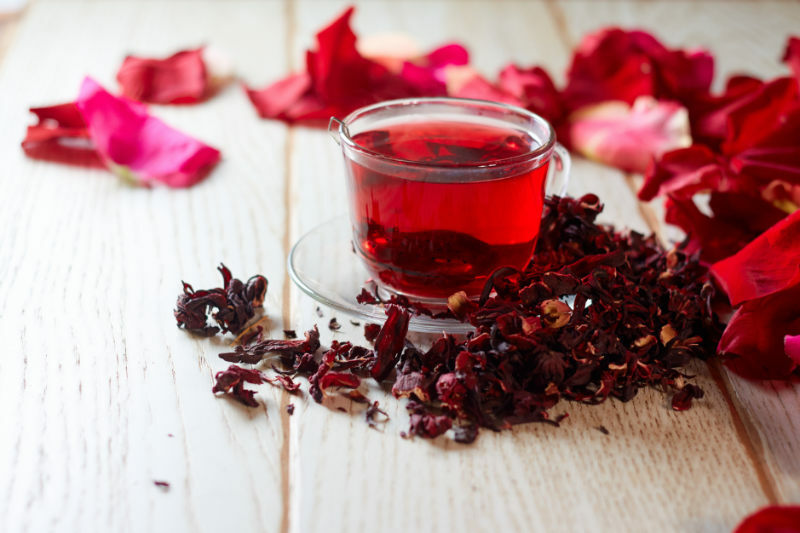 The research published by the University of London’s Centre for Pharmacognosy and Phytotherapy finds that polyphenols found in hibiscus tea can reduce the levels of a stress hormone called cortisol. Drinking Hibiscus tea is great for weight loss because of one very obvious reasons – it can be used to hydrate the body without torturing yourself by drinking plain, tasteless water. Hydration is extremely important for your overall health, but it will aid your weight loss goals as well. Not only drinking it will suppress your appetite and make you want to eat less, but it will also help to remove toxins and waste from your body. Hydration is also necessary to actually burn the fat as your body cannot properly metabolize fat cells while being dehydrated. Hibiscus tea not only helps you to lose weight, but it keeps you healthy as well. The study published in The Journal of Nutrition in 2010, shows that it can lower blood pressure. By consuming three times a day, the participants experienced blood pressure reduction. One big mistake that lots of people make is that they start sweetening hibiscus tea with either sugar of honey. It can be tempting to make it even more delicious, but doing it will harm your weight loss goals. Don’t consume additional calories from sweeteners and hope that hibiscus tea will eliminate the weight gaining effect. Another study, published in 2004 by the Society of Chemical Industry, shows that hibiscus can also reduce the cholesterol levels. The study concluded that it has high potency to reduce the ratio of LDL-cholesterol to HDL-cholesterol. That’s another health benefit of the super-tea backed by the science. To conclude, you can’t go wrong with drinking hibiscus tea as long as it is natural without added sweeteners. It is natural, tastes great and can help you burn fat. Start consuming it instead of sugary drinks, fix your diet, exercise a little bit more and you will see the results.